Note: The issue TDM 4 (2015) - ArbitralWomen/TDM Special: 'Dealing with Diversity in International Arbitration' has been published. 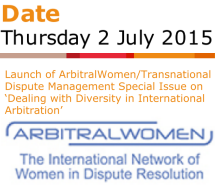 ArbitralWomen, Transnational Dispute Management and Ashurst would be delighted if you would join us for the launch of "Dealing with Diversity in International Arbitration" followed by a drinks reception. This Special Issue will analyse discrimination and diversity in international arbitration. It will examine new trends, developments, and challenges in the use of practitioners from different geographical, ethnic/racial, religious backgrounds as well as of different genders in international arbitration, whether as counsel or tribunal members. The launch of the Special Issue will be followed by the launch of the AW New Website.